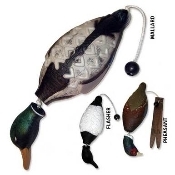 The Avery EZ Bird is available in both a mallard,Flasher and pheasant design. The mallard is similar to the Avery True Bird Mallard, but is about a third smaller in size. This allows smaller or younger dogs to easily fit the bird in their mouths without unnecessary “adjusting” and mouthing, which is a great aid in training reliable holding and delivery to hand. The pheasant is a perfect size and includes a soft, flexible tail that will not inadvertently poke a dog in the face when picking up or retrieving.